In the 1980s the stepsisters emerged front and center; manufacturers introduced mid-sized motorcycles that were radically updated or completely new. The commitment to the class is real; witness the array of sophisticated 1982 machinery. Kawasaki, in particular, became the '81 middleweight leader with the GPz550, a handsome lightweight Super-bike complete with three discs, adjustable suspension components and 12-second quarter-mile credentials. Although the 550 engine and GPz styling have changed little for 1982, the running gear is completely different—and much improved. 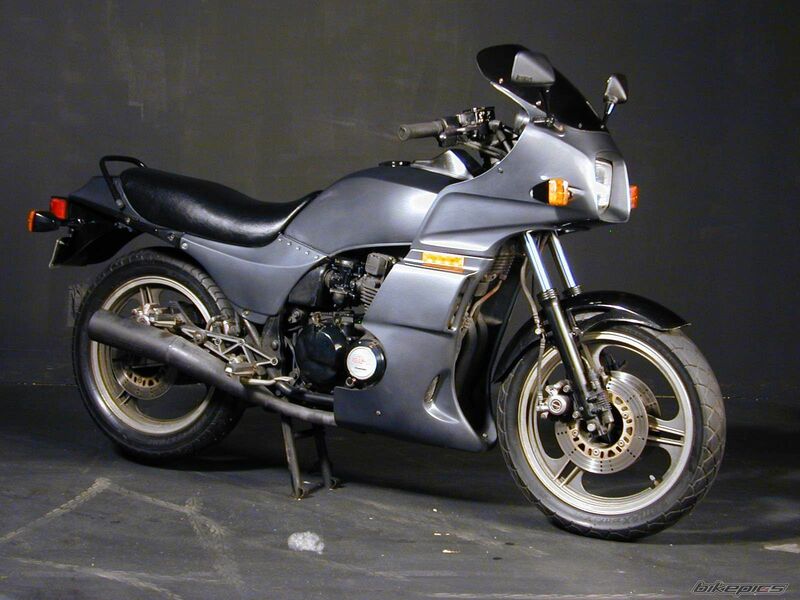 The GPz evolved from the 500 in 1980, becoming the Z550A1. The basic engine configuration remained the same throughout with double overhead camshafts running off a central chain. In '81 they got closer with the Z550GP, still with twin shocks but with 58bhp at 9000rpm, a handlebar fairing and an oil cooler. The engine and exhaust were painted in black, but it usually fell off when you switched on the ignition. The problem with this model is that the power was starting to overcome the handling. The logical progression was the true GPz550 of 1982 with Uni-Trak rear end. Wheelbase and rear wheel travel both went up, and the forks got air assistance and dual rate springs. They squeezed another 3bhp out of it with 28mm instead of 25mm inlet ports and Tekei carbs up to 26mm. Finish was better, and you can identify this one by the five-spoke wheels and black tail-light, it had the sidestand cut-out switch, and camchain problems were solved by fitting a Hy-Vo chain with Teflon-coated slippers. The final model came in 1984. This had the LCD unit set in the petrol tank, the three-spoke wheels and a frame-mounted fairing. Suspension was made easier to adjust and anti-dive went on the forks. By now they had got the hang of black chrome as well. Мощность: 58.00 л.с. (42.3 кВт)) @ 9000 об./мин. Мощность: 65.00 л.с. (47.4 кВт)) @ 10500 об./мин. Максимальная мощность: 58 л.с. при 9000 об.мин.